Just as one gazes out through a window on a February’s day by a fire, we look out on to our landscape we have watched all winter. As the time of spring draws forth one starts to envision how it will look in the future and what potential harvests we want to reap, which calls for the need for pruning, or a redirecting of growth to ensure a more profitable harvest. 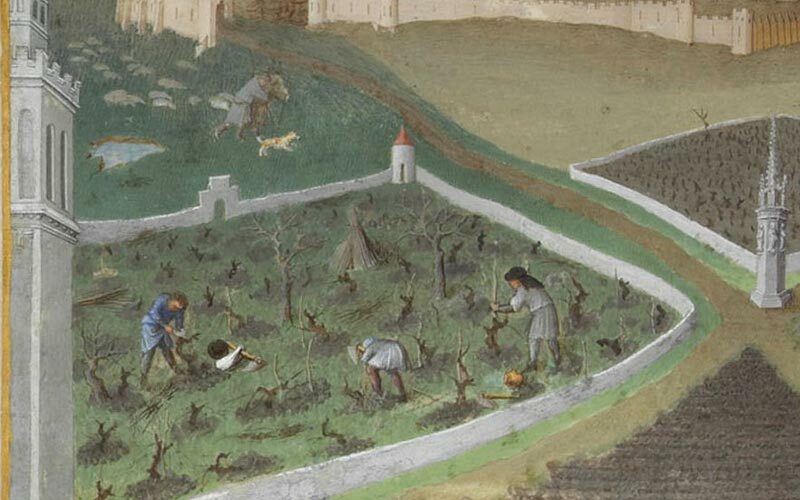 Whether that is grapes or our aims, our observations over these past months and a vision of the future, will lead to an intelligent effort of today, of how we decide to prune our grapes or refine our aims to come to the result that we sincerely desire. Post written by Brant S.
In January, we began our aims, February we quietly observed by the fire and now with march we are ready to prune back the old and to direct the new growth, as nature around us comes out of dormancy, so shall we too come into an active state. I started January with the aim of following through with tasks more thoroughly. I have noticed that I tend to put off the task because almost immediately I am confronted with a pause, for some reason my machine needs to use my mind to contemplate the task at hand. This can eventually grow into a whole mess of bad imaginings and soon instead of just doing it I am awash in a sea of imagination losing track of my initial aim. This hesitation I realized is usually the source of my inability to carry out tasks timely and efficiently. Yet as I observed myself and started to understand more through my verifications through time, it became clear certain aspects of my aim that needed more work. When one observes, oneself going through a process we inevitably see many unnecessary steps that from experience we can avoid in the future, and luckily, we can learn from others as well. In February, we learned about chief features, or the main obstacle in ourselves that will hold us back from reaping what we sow. That at the root our chief feature could not be removed with the chief feature. In other words, the intention of our aim, does not work if it is to remove fundamental human traits such as vanity and fear. So instead of wholly removing my hesitation, that stems from my vanity which I cannot do, I can prune out or decrease its manifestations. Vanity and fear are necessary to some degrees, without them we might not strive to achieve anything or foolishly approach a mother bear and her cubs. So in regards to setting our aim we must keep in mind there are certain aspects of ourselves that we cannot remove entirely. Just as a farmer season after season learns his crops, we too learn how we progress through our aims from sincere observations. The farmer starts to understand how to deal with their crop in certain situations, such as drought, frost, pests, while maintaining their system and always directing action towards harvest. New circumstances arise and change our position and in the spirit of the farmer we must adapt, maintain and prune our aims in a timely matter that will reap us a plentiful harvest for tomorrow. Have we gained new knowledge that have shifted our desired harvest of our aims, do our aims still reflect what we initially desired or do they need to be readjusted to present a more intelligent angle in relation to our self-knowledge that we have accumulated.? How we decide to prune is much like the way we decide to direct our aims after we have decided to start them. Do we leave them alone? Do we observe their growth and act accordingly? Do we forget about them, or act to late or too early? These and more will affect a season harvest or a direction of an aim. In the former, whether one eats or starves, in the latter whether one accomplishes their aims or runs around in circles. In both subjects, there is a sense of renewal, a force that will refresh our efforts and bring a new hope in regards to our aim. This period of March, the beginning of spring, symbolizes a renewal for inner and outer worlds. Noticeably we see nature start to bloom as well as people start to become more active outside. This is a time that instills a presence in us, it reminds us that the efforts of today affect the results of tomorrow, today is like the bud of a growing branch is it growing wildly or is it maintained by the diligent farmer.